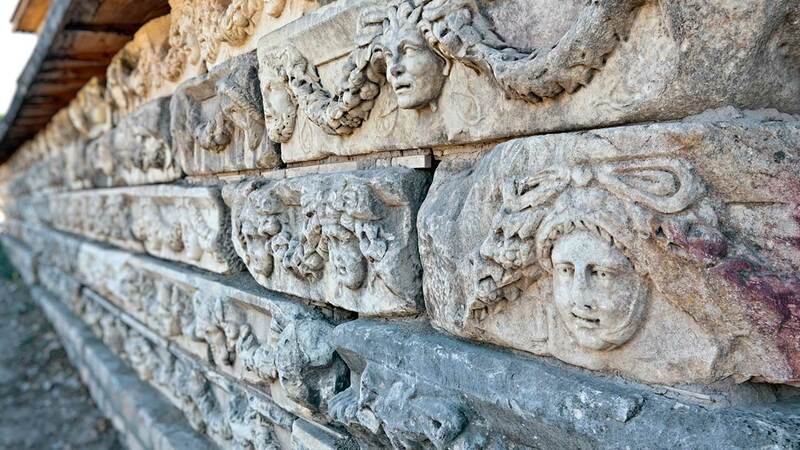 The whole world became alive in the skillful hands of Aphrodisias masters of sculpture; human faces had expressions, eyes had life in them, bodies almost moved; stories were told, legends were transferred to the next generations all through marble. Not only their precious city but the whole Roman world was adorned with flawless works of art. You will never forget your visit to this city of excellence and its world-famous museum. The desire to create beauty and love expressed itself on sarcophagi so deeply and lively that you would think they held life inside, not death. 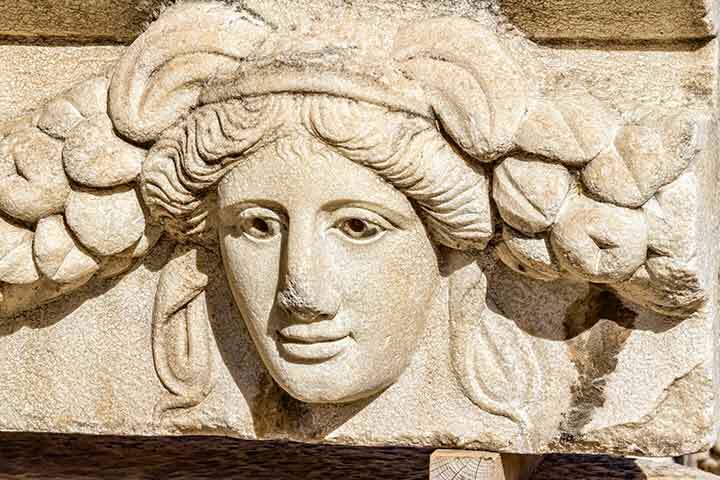 In this visit to the city of venerable Aphrodite, you will see breathtaking manifestations of “love” and “beauty” everywhere in the city and the artifacts displayed in the museum. 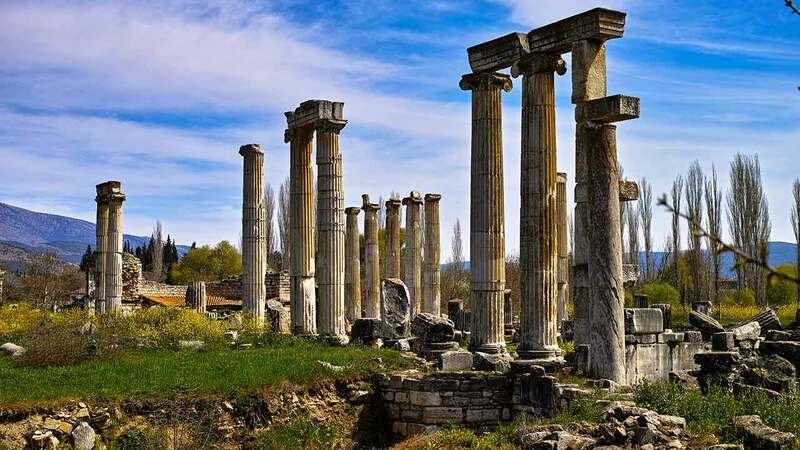 A comprehensive tour of the ancient city will take you to all of the monuments and state buildings where you will be informed by your guide about the history, the legends, important personalities and events behind them so that in the end you will have a complete understanding of life in Anatolia in the Hellenistic and Roman ages. You are welcomed by the exceptional Tetrapylon on entering the site which was re-erected in 1990. This was the monumental gateway to the sanctuary of Aphrodite which greeted the pilgrims of the day. It had 4 rows of 4 columns, hence the name. The Temple of Aphrodite is located in the center of the city, dates from the 1st century BC but as seen in most of the cult centers in Anatolia, there was an earlier Mother Goddess tradition in the vicinity. With the coming generations, the cult evolved to be the Lady of the city whom we later saw as Venus of Rome. It will be interesting for you to recognize the common attributes she shares with the Artemis of Ephesus which is obvious in the extensive symbolism on the dress of the cult statue in the museum. Today the temple has 14 standing ones out of the original 40 columns. The sanctuary was of great importance for the region until Christianity became widespread and the temple was converted to a basilica in the 5th century by the Byzantines. The city was situated close to high-quality white and blue-gray marble quarries which supplied the workshops around. 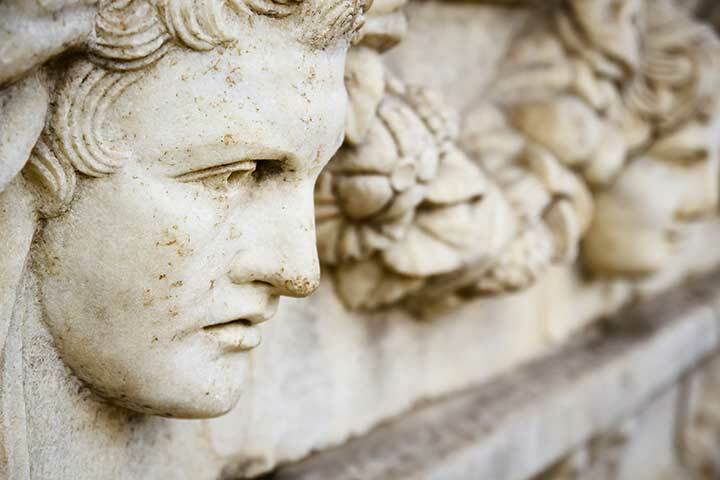 The School of Sculpture was active from the 1st century BC to end of 5th century AD which means the sculptors produced uncountable artifacts for hundreds of years that were not only appreciated in Anatolia but all over the Roman Empire and beyond. Some of the best examples are displayed in the museum. If you look carefully, you may see the signatures of the artists on some of the sculptures. Also, you will be able to see some unfinished and practice pieces lying around which will give you a glimpse of the ancient days. To the south of the temple is the Odeon. This beautiful semi-circular Roman building is one of the best-preserved structures in the city. It could be used as a Bouleuterion for the meetings of the Senate too. In the 5th century, it was adapted to be a palaestra according to an inscription on the molding of the stage. At the north of the remains is the Stadium which was used for athletic events and could hold 30,000 spectators. Measuring 262 m. by 59 m, it's larger than many of its kind in the Mediterranean and definitely one of the best-preserved. 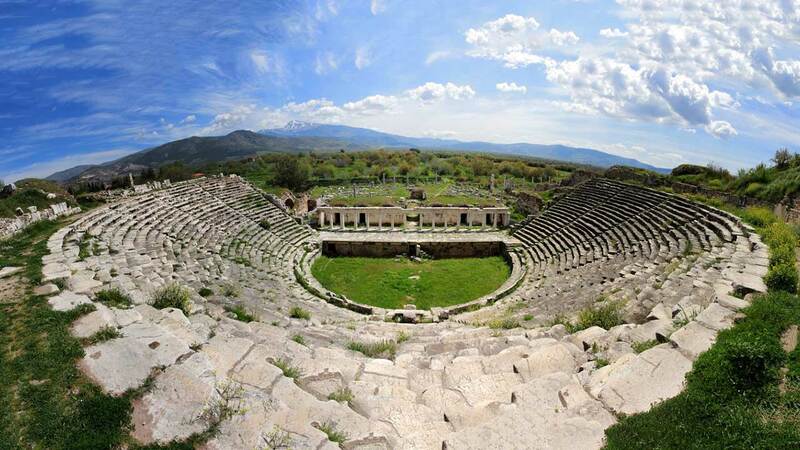 After the theater was damaged in the 7th-century earthquake, the eastern end of the stadium was used for games and wild beast shows. Outside the stadium, where the shops to sell food, drinks, and souvenirs besides an area to leave the carts. Sounds familiar, isn't it? The Sebastion is one of the latest discoveries in the ancient site. It is a monument dedicated, according to an inscription on the propylon from the 1st century, “To Aphrodite, the Divine Augusti, and the People”. A relief found in the ruins represented a personification of the city making a sacrifice to Aphrodite. The temple had two richly decorated porticoes with half-columns and a ceremonial way. Baths of Hadrian by the South Agora had colonnaded court in front and five great barrel-vaulted chambers, all lavishly decorated with the sculpture of important persons. Some of these sculptures are on display in the museum. The theater was completed in late 1st century BC and later modified by the Romans for gladiatorial combat. According to its inscription, it was dedicated to Aphrodite and the people of the city by Julius Zoilos who was a former slave of Octavian. The Agora was the large market area between the Temple of Aphrodite and the Acropolis. It was used for musical events, public gatherings, and speeches as well as literature competitions. All these events taking place in the heart of the city would attract people from the surrounding busy places like the Temple, Odeon, Sebasteion, and the Hadrian Baths bringing in more business and wealth to the city. The other places of interest are; the Bishop's palace by the Odeon and the Sculptor's Workshop where half-finished statues, practice pieces, and stone-carving tools were unearthed during the excavations. In this trip, you will also see the real “Meander” that gave the world its name as to define the curves of a river from which also born the verb 'to meander.' Meander River runs across a large section of western Anatolia bestowing fertility to the lands and prosperity to the region. The museum near Aphrodisias Ancient Site is well-known in the world; especially among the archaeologists, archaeology lovers, students of Fine Arts and sculptors. The museum contains a large number of finds unearthed in the excavations of it. Prehistoric artifacts date back to 5000 BC, and the museum will take you through the ages of the Archaic, Classical, Hellenistic and Roman Period objects, sarcophagi and statues made by the sculpture school of the time and contain the stunning cult statue of Aphrodite. The halls of the museum are The Imperial Hall, the corridor of Zoilos, hall of Melpomene, Odeon hall, display cases gallery, hall of Penthesilea, hall of Aphrodite and courtyard where the best examples of the artifacts created by the Aphrodisias masters of marble are at display. The highlight of the museum is the unique cult statue of Aphrodite that stood in the temple; quote from the archaeologist on the site: Like them [other Anatolian deities], the goddess stands in a stiff frontal pose, with her upper arms pressed close to her body and her hands extended forward. Her most distinctive attribute is her heavy over-garment (known as an ependytes) that conceals most of her body. The front of this garment is divided into horizontal zones, each of which is filled with complex figurative reliefs. 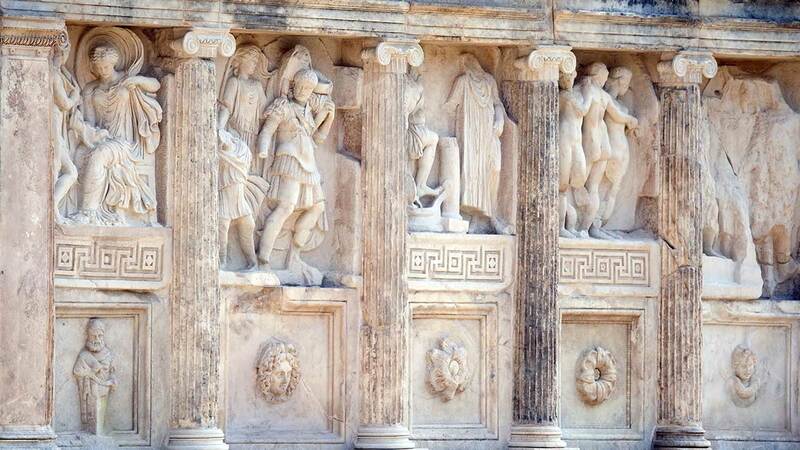 It is this series of reliefs that distinguishes the Aphrodisias goddess and shows her individual significance. Each motif symbolizes part of the goddess's divine identity and mythological sphere of power; they include the three Graces, Selene, Helios, Erotes, and Aphrodite herself. Furthermore, the particular division of Aphrodite's ependytes communicates the fundamental conception of Aphrodite as a goddess of earth, heaven, and sea.